I really enjoyed examining your custom medic. Really top notch. Great attention to detail on all the accessories and paint scheme. I do have to agree with Chewie on the Earthly look to the character. Right now, she looks like she is between two diffrent toy lines; GI Joe and Star Wars. I would recommend the design that is already on the med kit, the circle with verticle lines, should replace any red cross patches and the blue cross patch on her chest. Also, I am not sure you ment to do this or not, the colors you picked, tan and green, looks a lot like Doc from the '80s Joe line. 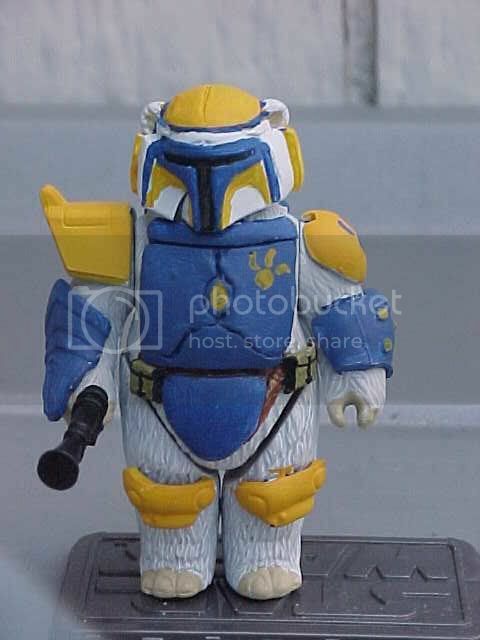 I would research some of the costume designs used in AOTC or ROTS movie extras and compare the color pallet to your figure. Change these things and the figure would then look more Star Wars then GI Joe. Just my opinon. Again, really great work there, I would love to see more of your work in future. The original Doc figure was indeed the inspiration for this figure, hence the color choices (The whole point of "Galactic Intelligence: Joint Operations Elite", which is my acronym for "GI:JOE" by the way, is to merge the G.I.Joe mythos into the established Star Wars Universe ) and red crosses have appeared in numerous Star Wars comics and other media simply for the viewers to identify medical characters/medkits, even though the red cross is a distinctly earthly symbol (as is the segmented circle on the medkit- it's the symbol for the Army's search and rescue units). "I tried to match not only the colors of Doc v1 (check out her glasses ), but the general "feel" of the figure when I set about designing this entry in my reimagining of the G.I.Joe mythos. I also tried to make her as much of a functioning, practical, field medic as I could, hence all of the pouches. I always felt that Doc v1 should have at least had a medical bag to complement the tiny little pouch on the bottom of his stretcher." It has been brought up before whenever anyone makes a Star Wars medical-themed figure that the common earth symbol of the red cross would not be appropriate in the Star Wars Universe since not every species has red blood (the red cross is a universal symbol here on earth for blood- every culture/nationality recognizes this fact). However, in some established media (mostly comics) the red cross symbol has been featured on medical characters (some Clone medics seen in the Clone Wars issues of "Star Wars: Republic" come to mind right away) symply for the audience to recognize the function of said characters without having to be explicitly told. Following this example, I have taken the artistic license of also utilizing the red cross symbol on this custom." You mean you actually want us to READ? Well, that's not actually true ... See, the red cross is a Christian symbol (it's the Swiss flag with colors reversed - the founder of the Red Cross was Christian & Swiss - and that flag's design is quite Christian) made for an organization that was founded on the humanitarian principles of Christianity. The international organsation is now called the 'International Federation of Red Cross and Red Crescent Societies' to reflect the fact that humanitarianism does not belong exclusively to the 1/3rd of the world that happens to be Christian. So, while red might be universally recognized as a color of blood, the Red Cross is not. It's just that it's the only symbol we tend to see in this predominantly (though by no mean exclusively) Christian, part of the world. It's pretty damn impressive that you made one of those cheap figs look so good! Oh, and that acromyn is just great! That's one mean-looking medic. I really like the equipment and the writing, very cool. Excellent medic Spectre. I like the Aurebesh writing. Is there a translated alphabet of it somewhere. I'd love to use it myself. The details on the case are amazing. I used the red Lifeline case for a clone medic I did a while back, but I didnt go as far as detailing it. I have to say it made it look a hell of a lot better. Excellent job. BTW just in case I didnt respond to any of your droids they look awesome as well. The M.A.M.B.A.s especially. Spectre, I did read what you wrote, but it was at 4am last night so my mind might not have been at 100%. I did comment on the great backstory too. My only thing about cross wasn't to do with the red color, but rather I think the cross is an Earthly symbol (like the Christianity reference). I am a devout Christian, and wasn't meaning to sound anti-religion at all, just that it seems Earthly to me. Almost like if you saw a Landspeeder with a Ford symbol on it, that's all. It's still a great custom and nothing wrong with you putting the cross on it, it's just my opinion that an Aurebesh symbol I think would look more Star Warsish. Either way, I still really like the custom. The undercover operative known by the codename "Chuckles" has always been pretending to be someone else in one form or another over the course of his life. As a child, Chuckles began acting on a well-known childrens' holovid which launched him into a stellar career as an actor that thrived until the beginning of the Galactic Civil War. While playing the part of a young, ambitious Senator Palpatine, in a live performance of a dramatization of his rise to power, Chuckles decided to do an impromptu song and dance number called "Senator Palpy Loves The Teens" in which he mock-seduced the attractive actresses playing Palpatine's young aids. Chuckles' wife, Melinda, who was the writer and executive producer of the program, was not at all amused by her husband's public acting out as she feared if would bring too much attention to their acting troupe's secondary performances smuggling messages to Rebel cells while on tour. The official outrage expressed by the Emperor's public relations officer was no match for the wild, hysterical response from the population at large, earning Chuckles and his acting company the ire of the Empire but the love of a public growing weary of Palpatine's New Order. Later, during a rehersal for a stage play about the "heroic" Imperial Military and their valiant struggle against the "insidious Rebel terrorists", Chuckles' acting troupe recieved a surprise in the form of a raid by actual Imperial military forces. Melinda was taken away for "questioning", and was never seen again. Angered and despondant over the loss of the woman he loved, Chuckles disappeared from his very public life and joined the Rebel Alliance. Chuckles has always been a natural chameleon, able to switch effortlessly from one role to the next, a skill that he puts to good use as an agent for the New Republic Intelligence Core. Chuckles can adapt to any accent, speech pattern, or dialect perfectly enabling him to appear to be a native of almost any planet in the galaxy. Though a man of short stature, Chuckles can act "larger than life" making most individuals mistakenly remember him as a larger, more imposing man. Adept at many forms of stage and holodrama make-ups, as well as utilizing masks made from medical synthflesh, Chuckles can flawlessly alter his appearance to suit any role required of him. Chuckles carries all of the masks/makeup/uniforms/false documents/etc. for his missions in a multiple code-locked suitcase lined with micro-thermal detonators. If anyone other than Chuckles attempts to open the case, the resulting explosion will not only disentegrate the contents of the case, but the case itself, the person attempting to open it, and most of the room said attempting opener was occupying at the time. When asked to perform in a live, command performance for the New Republic High Command of a dramatization of the events surrounding the rescue of then-Princess (now Supreme Chancellor) Leia Organa (now Organa-Solo) from the first Deathstar, Chuckles again proved to be completely unpredictable. While in the role of then wide-eyed farmboy (now well-respected Jedi Master) Luke Skywalker, apon first seeing the holo of the attractive young actress playing Leia being projected by the prop astromech droid, began belting out a power balad of his own design called "Hot For Sister!" (the chorus of which begins: "So what if we have the same parents, I'm from a farm afterall"), which resulted in a very red-faced Supreme Chancellor Organa-Solo, a calm-yet secretly embearrased stare from Master Skywalker, and some very uncomfortable looks from the rest of the assembled New Republic leaders (expept, that is, for Organa-Solo's husband, who could not stop laughing until there were tears streaming down his face ). "Why, just for laughs of course." As you can see, this is as close to a literal interpretation fo the original "G.I.Joe" Chuckles v1 action figure as is possible with Star Wars parts. The only major differences are the lack of a knife on his right hip (I didn't feel he needed it), the lack of a tropical print on his shirt (there is no known reference of this type of pattern anywhere in Star Wars lore so I left it off the finished figure), and the length of the sleeves (for aesthetic reasons,longer sleeves just look better for this type of character). I felt that Chuckles was always underarmed carrying just the pistol, so I decided to amp up his firepower a bit. I fugured that a blaster carbine-sized weapon would give Chuckles the extra firepower he needs while not being rediculously overarmed. The carbine is a custom made from some G.I.Joe rifle (Blackout?) I got in a trade last year and a piece trimmed from a POTF2 Stormtrooper rifle. I love these crossovers between Star Wars and GI JOE... so well done. I wonder why they don't make GI JOE figures in the Star Wars style... they'd go over better I think and give us TONS of customizing fodder. On this custom, wonderful backstory to him and the custom came out great. Good use of parts and the head was a good choice. Almost a bit rough paint (maybe too thick) on his face, but that could be just me. I know I can never paint skin though, and this looks way better than I do. Great job on the weathering too, not too much at all but enough to bring out details in the sculpt, like the slight wrinkles in the shirt. If they made a new Chuckles in the style, I'd get several. I think he kinda looks like David Soule (sp? ), the actor that played Det. Ken Hutchinson on the original "Starsky & Hutch" series I used to watch back in the seventies (yeah, I'm old, so sue me ).